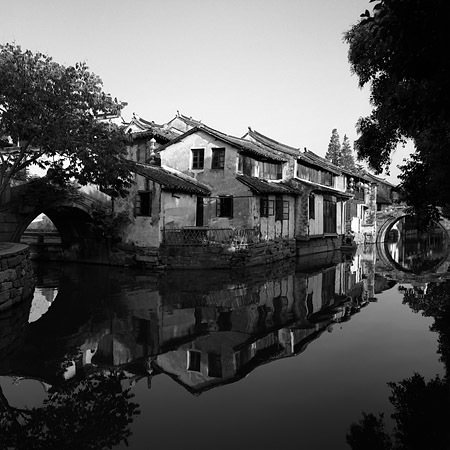 Due to its proximity to Shanghai and unique style, Zhouzhuang (周庄) has become one of my favourite destinations for trying new photographic approaches or testing photo gear. When I went there for the first time I mostly used a wide–angle zoom lens on a 35mm camera, which is your run–of–the–mill approach towards photographing the place; the second time around I wanted to stretch the limits a bit and used a telephoto zoom only. On my third trip I decided to spend a couple of days photographing with a medium format camera, Hasselblad 503CW, and black–and–white film to see what vision of the place this approach would result in. As far as the choice of black–and–white film is concerned, it was, on the one hand, dictated by the technical consideration of having to deal with very high contrast (even during the early and late hours of the day) and, on the other hand, caused by the curiosity as to what boundaries the "old" medium would impose on—or lift from—the creative process. 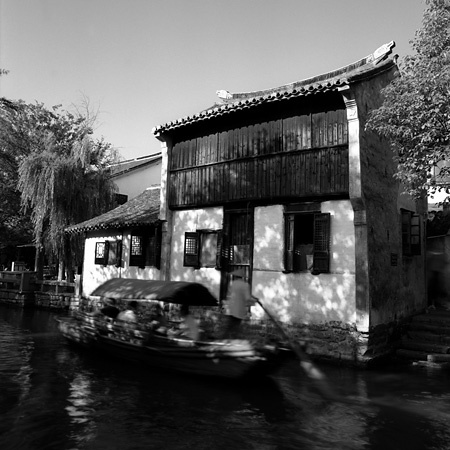 As to the use of the Hasselblad V system, I wanted to see what photographic approach it would dictate, as well as how the camera's relatively slow operation would influence my perception of Zhouzhuang and, again, the creative process. As it turned out, using black–and–white film had two implications. 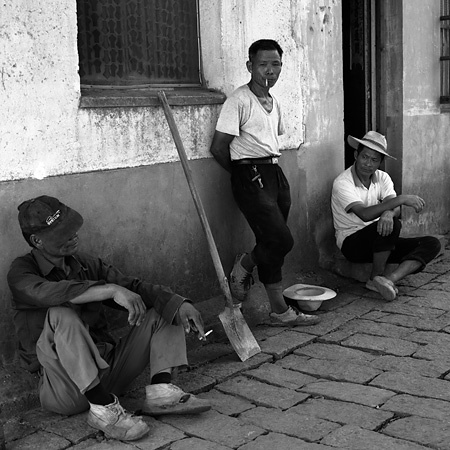 On the technical side, the contrast was very high and the great latitude of black–and–white film was the only sensible choice to handle it—most scenes required six to eight stops of latitude to capture shadow detail and not blow out the highlights; as you know, most slide films' latitude is only about five stops and digital capture is slightly more forgiving. 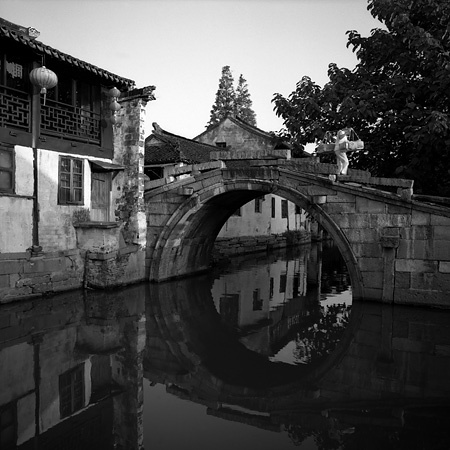 Black–and–white film even allowed enough room to maneuver and use a yellow filter! The only caveat is that automatic dust removal (Digital ICE) cannot be used when scanning negatives and retouching digital files in Photoshop takes quite a bit of time. On the aesthetic side, I, naturally, entirely ignored colours and mostly considered what gradations of grey would be reproduced in the negatives. 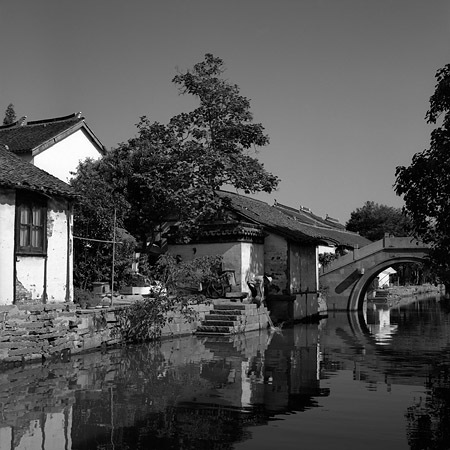 As a result, I bypassed some shooting perspectives that drew my attention in the past yet lingered over some places that I did not even notice before; also, I generally found that Zhouzhuang is much richer in gradations of grey than in colours. Combined with the great latitude of black–and–white film, all of this created quite a few new photographic opportunities. Slower operation of the Hasselblad system had several implications, too. First of all, I was looking for interesting scenes much harder and looked through the viewfinder and set the camera on the tripod only when I felt I had found a scene that was worth taking a photograph of. The really interesting part, however, was that I felt that just finding a nice composition was not enough—now that I had gone this far, I might as well go one step further and try to add something that would make the photograph differ from the usual nice snapshots. Something tells me that had I been using a 35mm camera (digital or film) I would not have had this drive. 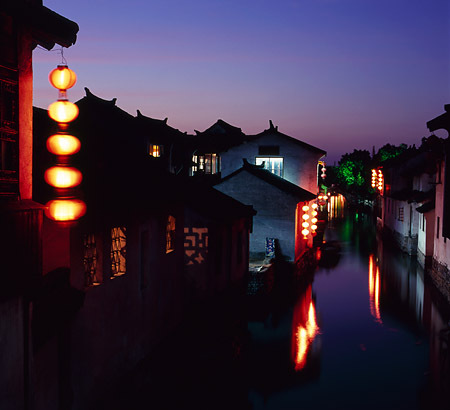 When depicting a place such as Zhouzhuang, one way to improve images is including elements that would depict—or, at least, hint at—the character of the rural life. 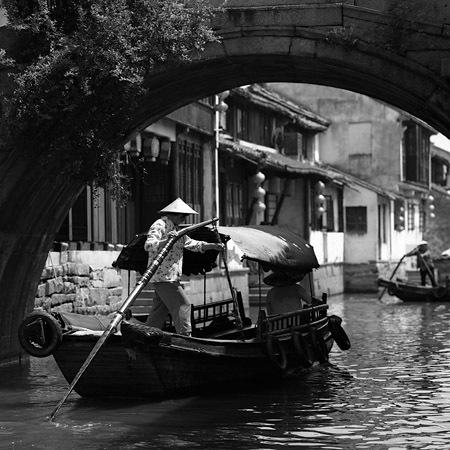 One such element, not only in Zhouzhuang but pretty much anywhere, is local people going about their day–to–day lives. 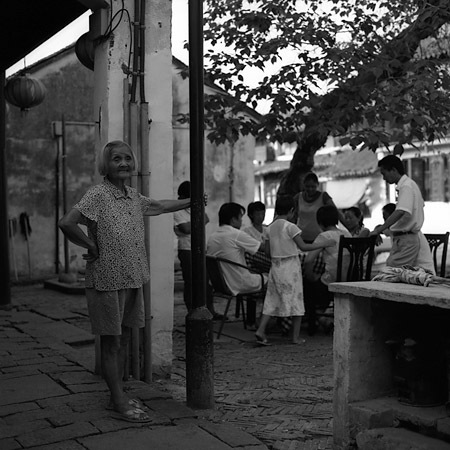 Because of the number of tourists Zhouzhuang is a place where it is very, very difficult to avoid having travelers in photographs; including only local people in a meaningful way that would support one's creative intent is furthermore challenging. The slow operation of the Hasselblad stimulated my persistence, though, and, telling myself that the decisive moment was bound to come if I were patient enough, I simply waited. In a few instances I ended up waiting for quite a long time but the delight of the moment when I pressed the shutter release button exclaiming "Gotcha!" certainly was worth my time. 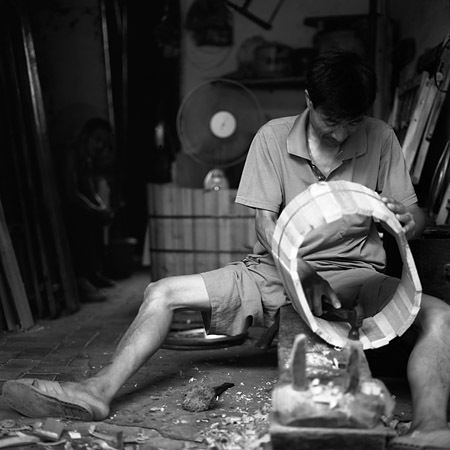 Have you ever seen how wooden buckets are made? 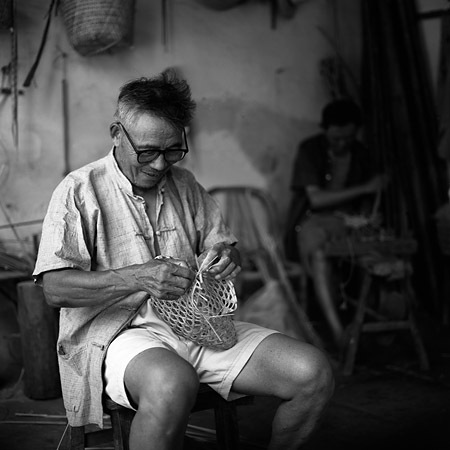 Talking about photographing people (environmental portraiture), it generally is easy to get lazy (or shy), pull out a DSLR with a 70–200 or similar zoom, turn VR (Vibration Reduction) on and shoot at 5 fps from afar while remaining unnoticed—yes, I have done this a number times. This style, of course, is not feasible with the Hasselblad—the system requires a totally different approach. If you want to do environmental portraiture with a Hasselblad you have to get close to people and... blend in (have you ever heard of a white guy with a massive Hasselblad camera becoming invisible in a crowd of Chinese people?). Seriously, though, my tactic was quite straightforward—I simply approached the people who interested me photographically, stroke a conversation (note that I was always genuinely interested in the conversation, too—you cannot fake it) and waited for the moment when everyone got comfortable with me hanging around and occasionally looking through the viewfinder and returned to what they were doing before I appeared. Was it challenging? Quite. But, again, I believe the efforts were worth my while and the pictures, hopefully, show more intimacy and closeness. I suppose by now some of you might expect a conclusion or suggestions whether the Hasselblad system and black–and–white film are superior/inferior, suitable/inappropriate, etc. for this kind of shooting. At the risk of disappointing you, all I can say is that it was just... different and a lot of fun!